After the Flyers walked out of HSBC Arena with a 4-2 victory tonight, I have to wonder if the first five minutes could have gone differently. The arena was electric and certainly had to have some sort of effect on the Flyers. However, Pat Kaleta took a penalty in a post-whistle scrum and Philly converted on the ensuing power play. Whether or not Ryan Miller allowed a weak goal is irrelevant. Personally, I think a deflection warrants a free pass based on the fundamentals of goaltending. Buffalo managed to tie the game but the second period did them in. Two bad turnovers led to two easy goals and it was all the Flyers needed. Not to mention the power play didn’t really do their part. – Drew Stafford scored a nice goal in the first and it seemed like the power play would continue their play from game two. However, a failed attempt on a double minor and a lengthy five-on-three. Those two momentum killers could be pointed to as a major reason the Sabres lost this game. – Speaking of Stafford, hopefully that goal gets him started. His linemates, Brad Boyes and Tyler Ennis, have yet to show up and Stafford was equally invisible during the first two games. I think it was a wise choice to move Boyes to the wing with Paul Gaustad and Nathan Gerbe. Of course, that was necessitated (in part) by the injury to Pat Kaleta. I still think he will function well on the wing with those two moving forward. – The depth and talent chasm seems to be shining through. Buffalo’s lack of top end talent at center and at defense was looking like a weak spot entering the playoffs. It seems as if Philadelphia has exploited that. Of course the lack of talent at center has hurt the Sabres more than it has helped Philly. However, Buffalo’s blue line is in desperate need of a top-three talent. Sure, Chris Butler, Mike Weber and Marc-Andre Gargnani have been great. I haven’t hated Tyler Myers all that much either. But Steve Montador hasn’t been good at all and it is killing the Sabres in their own zone. For example, both of Philadelphia’s second period goals were a result of shoddy defensive coverage. – Finding the net. One thing that has hurt the Sabres is their ability to convert on their chances. In game two the Sabres scored a bunch of goals but Ryan Miller allowed two questionable ones that were the difference in the game. Tonight, the Sabres gave up two glorious chances and one pretty good on that the Flyers cashed in on. 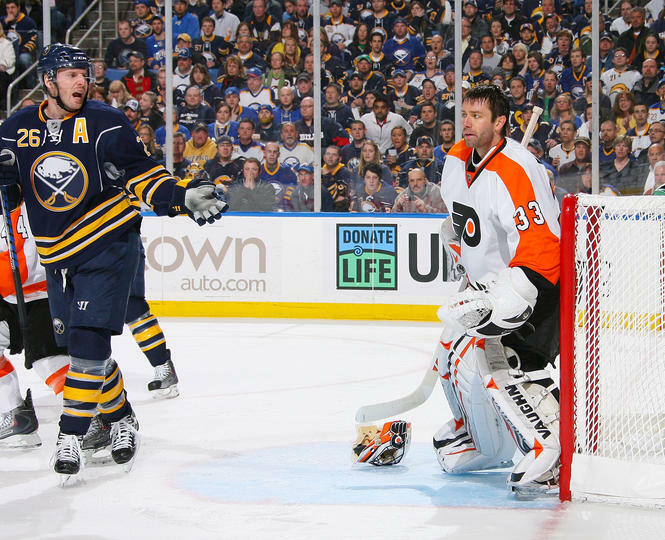 Buffalo out shot the Flyers weren’t able to cash in on most of their chances. Moving forward the Sabres will need to buckle down in the defensive zone. Just like after game two, Buffalo will have to find a way to limit turnovers and chances to the Flyers’ top scorers. I would like to think if there were two or three less point-blank chances on Ryan Miller, he might be able to get you a 3-2 win.